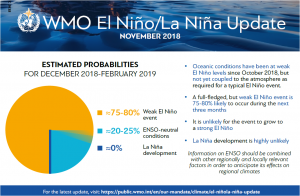 November 28, 2018 – There is a 75-80% chance of an El Niño developing by February 2019, although it is not expected to be a strong event, according to the latest update from the World Meteorological Organization (WMO). Sea surface temperatures are already at weak El Niño levels in part of the tropical Pacific, although the corresponding atmospheric patterns have not yet materialized. WMO accompanied the El Niño Update with a global seasonal climate update, which indicated that precipitation patterns predicted for December-February resemble those normally associated with El Niño. In some regions the precipitation response has been weak, however, or not in keeping with those typically associated with El Niño. The El Niño/Southern Oscillation (ENSO) is a naturally occurring phenomenon involving fluctuations of ocean surface temperatures in the equatorial Pacific, coupled with changes in the overlying atmospheric circulation. It has a major influence on weather and climate patterns over many parts of the world. Sea surface temperatures in the east-central tropical Pacific have been at weak El Niño levels since October 2018. However, the atmosphere has not yet responded to this additional warmth, and the upper level winds, cloud and sea level pressure patterns do not yet reflect typical El Niño features. Model forecasts suggest that this will change within the coming month or two. 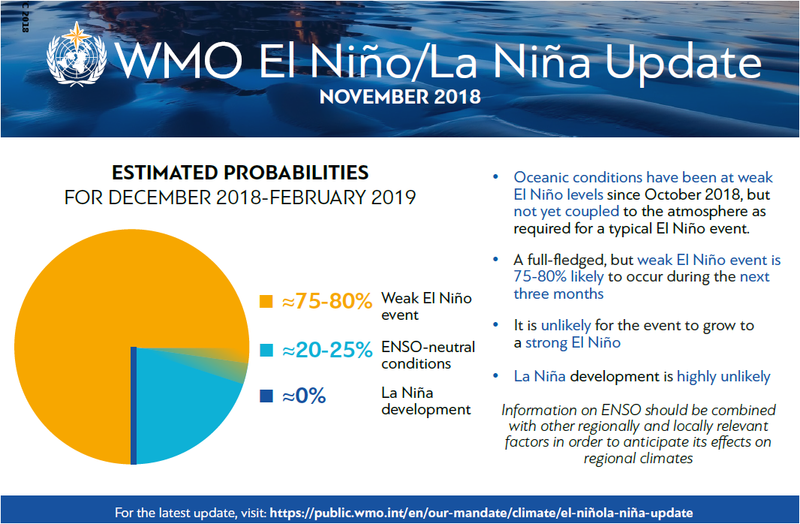 The chance of a full-fledged El Niño between December 2018 – February 2019 is estimated to be about 75-80%, and about 60% for it to continue through February-April 2019. Model predictions of the strength of the El Niño range from just a warm-neutral condition through to a moderate strength El Niño event, with sea surface temperatures peaking at approximately 0.8 to 1.2 degrees Celsius above average. The chance for a strong event (sea surface temperatures in the east-central tropical Pacific rising to at least 1.5 degrees Celsius above average) is currently low. “The forecast El Niño is not expected to be as powerful as the event in 2015-2016, which was linked with droughts, flooding and coral bleaching in different parts of the world. Even so, it can still significantly affect rainfall and temperature patterns in many regions, with important consequences to agricultural and food security sectors, and for management of water resources and public health, and it may combine with long-term climate change to boost 2019 global temperatures,” said Maxx Dilley, director of WMO’s Climate Prediction and Adaptation branch. Scientific progress on the understanding and modelling of ENSO, underpinned by major observational programmes and coordinated research initiatives, has improved operational monitoring and prediction capabilities, helping society to prepare for associated hazards such as heavy rains, floods and drought. WMO’s update is based on forecast models and expert interpretation from around the world. It is used by planners within the United Nations system, and complements information issued by National Meteorological and Hydrological Services and WMO Regional Climate Centres as a source of information for country-level decision-making by disaster managers, for planning in climate-sensitive sectors, and by governments. WMO’s global seasonal climate update for December 2018 through February 2019 is based on an ensemble of global prediction models run by WMO-accredited centres around the world. It is currently in a trial phase. A tilt of the odds towards above-normal surface-air temperature is forecast in most of Asia, Europe, North America, the Caribbean, Africa, Australia, the Indonesian archipelago, and South America. Exceptions include portions of mainly southern South America, much of southeastern North America, parts of northwestern Europe and part of south-central Asia. Most of the regions with above-normal tendencies also saw above-normal temperatures during August-October 2018. An enhanced probability of below-normal precipitation is predicted in the Caribbean, central America, part of northern South America, the offshore islands of southeast Asia, the southern part of the Indonesian archipelago, some south Pacific islands, portions of southwest Africa and eastern equatorial Africa, subtropical southwest coastal South America and southern South America. Above-normal precipitation is favoured in part of southern North America, part of southeast South America, part of northwest North America, central and northern Asia, part of southwest Asia, part of the eastern Maritime Continent, and part of Europe. Near-normal precipitation is favoured in parts of interior northern tropical Africa. These global forecasts provide predictions of large-scale patterns, which need to be further calibrated and optimized to derive regional and national scale forecasts. WMO Regional Climate Centres, Regional Climate Outlook Forums (RCOFs) and National Meteorological and Hydrological Services carry out these tasks to provide more detailed outlooks. National Meteorological and Hydrological Services will continue to closely monitor changes in the state of ENSO over the coming months. El Niño is often associated with warm and dry conditions in southern and eastern inland areas of Australia, as well as Indonesia, the Philippines, Malaysia and central Pacific islands such as Fiji, Tonga and Papua New Guinea. In northern hemisphere winter, drier than normal conditions are typically observed over south-eastern Africa and northern Brazil. Wetter than normal conditions are typically observed along the Gulf Coast of the United States, the west coast of tropical South America (Colombia, Ecuador and Peru) and from southern Brazil to central Argentina. Parts of eastern Africa and southernmost parts of South Asia also usually receive above-normal rainfall. El Niño is associated with milder winters in north-western Canada and Alaska due to fewer cold air surges from the Arctic – a result of a large-scale region of lower pressure centred on the Gulf of Alaska/ North Pacific Ocean. It is important to stress that these are typical effects – not specific forecasts – and that actual conditions vary according to the strength and timing of the El Niño event. Other factors (such as the Indian Ocean Dipole or the North Atlantic Oscillation/Arctic Oscillation) can also have an important influence on seasonal climate. Global-scale seasonal forecasts, including those of precipitation and surface temperature, are routinely produced by WMO accredited centres using sophisticated atmosphere-ocean coupled models, which take into account ENSO as well as other climate drivers. There are now 13 WMO Global Producing Centres of Long Range Forecasts, whose products are consolidated by a Lead Centre of Long Range Forecast Multi Model Ensemble (https://www.wmolc.org/).